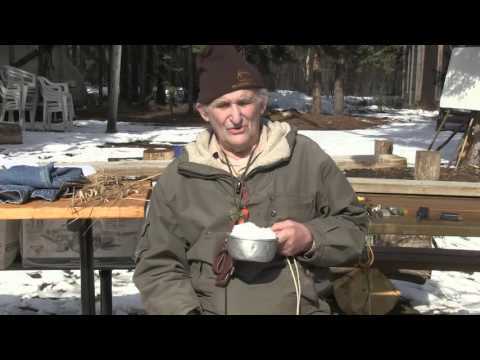 Mors Kochanski video on "Eating Snow"
Re: Mors Kochanski video on "Eating Snow"
The problem with "eating" snow, could be in the parasites/bacterias that are present in the snow and by "eating" it not melting it and boiling the water, you could possibly get diarrhea and that would result in dehydration... I'm not sure! I even heard that it would be possible to get giardia in rain water, the theory(cause I don't know if it is founded) is that a body of water containing giardia wile evaporating would/could carry the micro organisme into the air and then when the moisture turn into rain/snow and you ingest it, it could infect you.... But like I said I'm not sure!! I never had giardia, and I never really treated any water that I've drink in the wild. afaik, rain water is 'distilled', the only exception is when there are certain gases in the atmosphere and the rain water reacts with those, creating acids (acid rain). The same more or less applies to the snow. Never heard of 'live' things in either. Funny anecdote about the yellow snow. Raindeer people of the arctic Europe and Asia are having hard time peeing in the winter, the deer are in such great need of salts and minerals, they stampede and fight each other if they notice yellow snow coming up. Scroll down to #7 "The Circle of Piss". Good video on eating snow...thanks for posting Hoop. Precipitation picks up all sorts of stuff as it falls so any thing that can be airborne will also be in snow. Bacteria and other single cell organisms can easily be picked up and carried along by the wind. Many organisms, including Giardia, have a life stage that lets them survive in dry conditions, waiting until they encounter moisture to become re-animated. Heat your snow/water to more than 65 degrees C and you will be safe. Interesting video. I never carry water with me in the winter. I’ve always said why would I carry the extra weight and have the hassle of trying to keep it from freezing when there is an abundance of water in snow form all around me. I’ve been criticized many times , for many reasons, for eating snow, which I warm up in my hand before popping it in my mouth. This is the first person I’ve heard that would dare to suggest that eating snow is acceptable. I do have to question his assertation that Eskimos would go for weeks only eating snow. I’ve read the journals of Rasmussen, Stefansson, Boaz, Houston, Amundsen, Peary, Ross, Pryde, Lyall and many others, all of whom spent considerable time living and travelling with the Inuit. There are lots of mentions of going many days without water and having great thirst from the lack of blubber/ fat to burn for melting snow. I don’t recall reading that they would eat snow to quench their thirst. I’ve spent many winters living in tents with Cree, Ojibwe, Chipewyan and Inuit natives. All of them would look at me funny and show great concern if they saw me eating snow. It’s remarkable to me that all these cultures have a similar story that they tell me. It goes that 2 hunters were travelling a long way and had no water. One of them decided to eat snow and the other one didn’t. The hunter that ate snow died and the other one made it home. The story told to me was almost identical from each culture. From my experience, there seems to be a strong resistance of native people to eating snow. Others may have different experiences. As for me, I’ll continue to eat snow and it’s nice to know at least one person won’t think I’m nuts. Oh, and I've never gotten sick or had ill effects from it either.